Megafaun’s Phil Cook has had another run in with nature. During the recording of his 2009 eponymous debut he battled a violent thunderstorm. This time around, “Mother Nature” has locked him in a room and asked him for more. 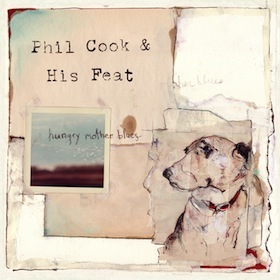 With guitar, banjo, and dobro in hand, Phil Cook and His Feat offer up Hungry Mother Blues. But before the first note is heard there’s the matter of the collage style cover art created by Catherine Edgerton of Midtown Dickens. It’s one of eroded images, worn out single paper dreams, and layers of a bit of one’s soul. Earth toned elements, taped and pasted together, re-figure and recycle creating something new; something beautiful. It’s a fine example of what good album art should do, one that accentuates the intimate, vulnerable and personal journey that embodies Cook’s Hungry Mother Blues. Although recorded in a back room during a rare North Carolina ice storm, the album, conversely, acts as the perfect front porch summertime soundtrack. Providing us with unaltered instrumentals, Cook creates a score that invokes a polite nod to John Fahey, Elizabeth Cotton, and the finger-picking, slide stylings of early 20th century country and blues. Following an initial listen I wrote down three words in my notebook: birth / re-birth / and new beginnings. Those are the themes, or characters, I kept returning to as one song lead into the next. With each song, Cook allows his instruments to become alive, not in an effort to create perfection, but to justify their soul. He doesn’t play by the book; he plays from the heart. That’s what makes this record so real. As a song-cycle, each of Hungry Mother Blues tracks are dedicated to someone in Cook’s life, be it a friend, a bandmate, or more importantly, Cook’s unborn child. Each one of these songs seems to be a chapter, or celebration, of those in his life. They play out so naturally and with ease, that you honestly feel the album is just for him. You’re welcome to pull up a stool, but whether you’re there or not, these songs are going to be played. The most accessible, longest and possibly the most refined track on the album is “Ballad Of A Hungry Mother.” An elegant mix of sharp slide work and deft fingerpicking, it may be the most visually inspiring song on the record. Dried creek beds, loose dressing gowns and red clay stained feet—dawning skies that break over pristine, dew laden fields—terrain sliced by the bare feet of a sacrificial mother.